Teeth Cleaning Bangkok, Dental Clinic, Dentist by Bangkok Smile Dental. Bad breath, or Halitosis, comes in many forms and may be due to one of many causes. Halitosis is an extremely embarrassing problem for many people, and is usually caused by poor dental hygiene or the presence of food that gets stuck in the teeth. Halitosis or bad breath is caused by the presence of volatile sulfur compounds on the breath, principally methylmercaptan and hydrogen sulfide compounds. In most dental patients, it is the millions of bacteria in the mouth and on the tongue that cause bad breath. Unpleasant odors from the mouth can strike periodically or be continual depending on the cause. This vexing problem can be broken down into three main sources: external, intra-oral, and extra-oral. 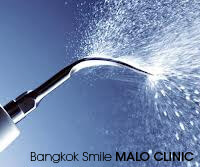 At Bangkok Smile MALO CLINIC, we are your one-stop shop to address such a persistent breath problem. Once a symptom arises, you can visit our dentist/periodontist office for consultation. If gum disease is found to be present, a comprehensive treatment plan will be prepared by our periodontist to combat this common source of embarrassment. Without proper and consistent brushing and flossing, and routine examinations by your dentist, food remains in the mouth, which is a breeding ground for bacteria, which, in turn, causes odorous breath. Food that is allowed to collect on the teeth, gums, and tongue may cause the gums and tooth decay, emanating an unpleasant odor and bad taste in the mouth. Dentures that are not cleaned properly may be collecting bacteria and remaining food particles which cause bad breath. One of the primary symptoms of this irritated gums/periodontal disease is foul, odorous breath, and an unpleasant taste in the mouth. This condition requires immediate care by an oral health professional. This condition is often a large contributor to halitosis. Some prescription drugs and medicines can cause dry mouth as a side effect, especially treatments for depression and high blood pressure. Also, certain medical conditions affect the salivary glands, so they don't produce as much saliva and the mouth tends to be more dry, or by continuously breathing through the mouth, instead of the nose. Not only do tobacco products such as cigarettes, cigars, smokeless tobacco, chewing tobacco, and snuff stain the teeth and put the body at risk for a host of diseases, they also contribute to bad breath. Tobacco users are at a bigger risk for breathing problems as well. Our AIR-FLOW® Cleaning utilizes an air-powder mixture and water for a variety of preventive and restorative dental treatments. Not only does it make air-polishing reliable and efficient for teeth cleaning, it also delivers comfort to our patients since it utilizes no curettes and makes no noise. With the gentle application of kinetic energy, AIR-FLOW® will not damage nor scratch the tooth surface. In short, it is our key to success in keeping your smile at its cleanest and most beautiful. With AIR-FLOW®, our dentist easily applies a spray of air, sodium bicarbonate, and jet water to quickly remove plaque and stains in your teeth without casusing any pain or discomfort. It cleans much faster and more thoroughly in comparison with conventional brushes, rubber cups, pastes, and polishing strips - without being abrasive. Plaque, soft deposits, and discolorations disappear quickly and painlessly - even from very tiny areas.